Samsung is one of the top sellers of Android tablets so far, yet even so, an executive at Mobile World Congress admitted the company hadn't been very successful. But where Android tablets have struggled to gain traction, Windows 8 tablets are generating a lot of interest among manufacturers, consumers, and business users alike. 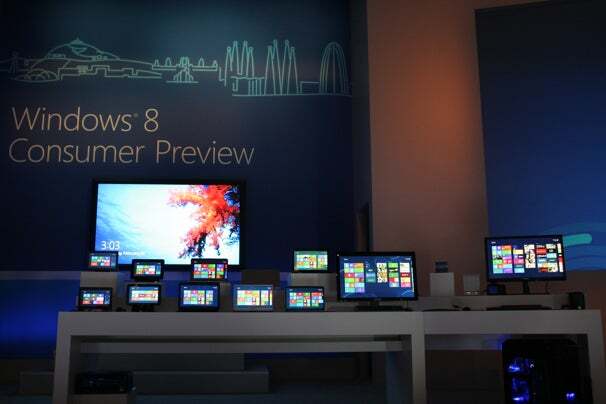 The Wednesday release of the Windows 8 Consumer Preview may serve to strengthen the case for Windows 8 tablets. But as with everything about the upcoming OS, the success of Windows 8 tablets is predicated on the idea that users buy-in to the dramatic Windows redesign. Windows 8 Tablets: The Great Unifier? Windows 8 tablets have the potential to provide a uniform experience across devices. It's for this reason that even mobile-centric manufacturers like ZTE are considering Windows tablets as potentially changing the balance of power in the tablet market. 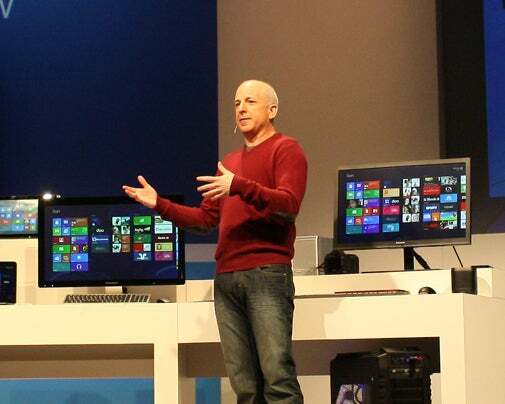 Sinofsky shows off Windows 8. As Microsoft demonstrated in Barcelona at its Consumer Preview launch event, Windows 8 works seamlessly across laptops, desktops, and both x86 and ARM-based tablets. Microsoft even started the event by showing how Windows 8 was optimized for finger-friendly navigation on a tablet--punctuating the company's commitment to mobile. While we've had no official word on Microsoft syncing up its current Windows Phone 7 platform to Windows 8, rumors already abound. Logic dictates that Windows Phone 8 will further extend the Windows 8 experience to your handset. The idea that your tablet could fundamentally look and function the same way as your laptop or desktop is very appealing; even better is the prospect that you could buy software that scales across all platforms, meaning you're not locked into one device for using the software you want, however you want to use it. The potential for all of this synergy is tremendous, albeit qualified by a fair number of variables: If Microsoft gets critical mass on app development; if Microsoft provides the tools for businesses to perform necessary tasks and device management; if Windows tablets can compete head-on with Apple's iPad behemoth in price. All of these "ifs" are unknowns until closer to the Windows 8 launch--and even that remains unknown. Educated yet unconfirmed guesses peg Windows 8 as launching in time for the 2012 holiday season. What is confirmed: the smooth transitions between devices—at least as demoed by Microsoft--and the potential for interoperability among devices. This pipe-dream appeal keeps Windows 8 tablets on our radar. One of the hot subjects for Windows 8 is how it will work on ARM processors. ARM processors--already used in Android tablets and phones--are expected to have better power efficiencies than Intel's own platform for running Windows 8. The cost of an ARM processor may be lower, too. Michael Angiulo, corporate vice president of Windows Planning, joined Microsoft's president of Windows Steven Sinofsky on-stage to demonstrate how Windows 8 worked on an Nvidia Tegra 3 tablet. We first saw the Tegra 3 tablet during Nvidia's press conference at CES 2012, but this time, we got a little more context about how Windows 8 will work. In Barcelona, Angiulo showed off a more comparative perspective on how Windows 8 works on a tablet running an ARM system-on-chip (SOC) processor. We saw Office apps working on Metro; only apps created for Metro will work on ARM chips. The catch about Windows on ARM? You won't be able to run x86-based apps, only the newer Windows Metro-style apps. Small businesses and corporate installations that have hundreds or thousands of x86 apps and browser plug-ins to support will be left in the dark. They will be relegated to looking at Intel- or AMD-based tablets, where the desktop mode will at least give you a chance to try and run the apps you need. At its launch event, Microsoft this week showed Windows 8 tablet types running Nvidia's Tegra 3, Texas Instruments' OMAP, Qualcomm's Snapdragon, and Intel's Clover Trail. Tablets based on these chips will be able to use the connected standby power management features of Windows 8. “The reason they can do this is they have the same code," noted Sinofsky. "We wanted to use the same kernel and same OS software across all of the ARM platforms.” And by having power management, these tablets will be better able to stand up to the all-day computing demands of mobile users. Qualcomm and Nvidia are each working with Microsoft to help to seed developers with Windows 8 tablet units, so the software-creation process can continue in parallel with the final preparations for the OS. In the meantime, for now we're left salivating for more details. While Windows 8 tablets have the potential to make a big impact, they're not here yet. Nor have we heard anything about how Microsoft's Windows 8 strategy will fit in with Windows Phone and Xbox. It's logical to take the macro view that Microsoft would extend Windows 8 to its other platforms in a grand unification of interface as well as of media and app stores, but that's not something Microsoft is talking about. If this were to happen, though, users could be the big beneficiaries of a well-implemented strategy, and Microsoft could rapidly gain ground in both the phone and tablet markets. Have you downloaded Windows 8 Consumer Preview? Or do you have no interest in changing to a new version of Windows? Either way, we'd like to hear your opinion. Please take PCWorld's Windows 8 Survey. It'll take five minutes or less. For more blogs, stories, photos, and video about Microsoft Windows 8, check out PCWorld's complete Windows 8 coverage.